Clare holds a M.S. in Teaching & Curriculum from the University of Rochester. After a decade as a language teacher, she is now focused on sharing her love of music with others. She teaches piano, hammered dulcimer, and jouhikko to children and adults of all levels. 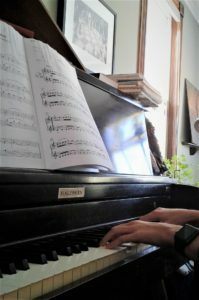 She is committed to music education that engages and motivates learners while also helping them to develop strong technique and musicality. Lessons and workshops are customized to meet learner needs and interests, offering opportunities to explore both traditional and classical repertoires. Based in Houghton, Michigan, Clare is also able to travel for workshops. Contact Clare for more information.